Lisa Higgins, director of the Missouri Folk Arts Program, poses in her office on April 22, 2013. 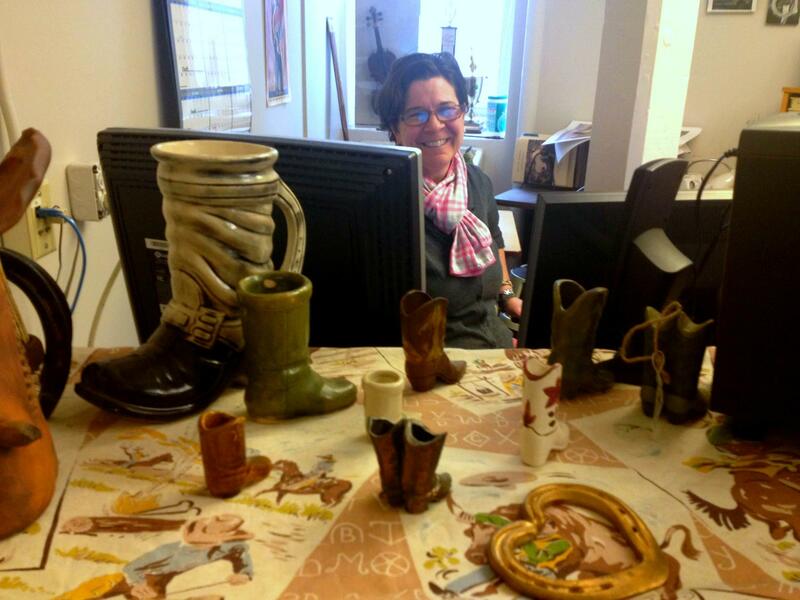 Tiny cowboy boots decorate Higgins' workplace. The folk arts program helps fund the annual Missouri Cowboy Poetry and Music Festival. "Kind of like the blues, cowboy poetry can be a little blue. And by that I mean, maybe a little vulgar. Because you have a community of people who are isolated and kind of share a lot of inside jokes. But really, as much as that humor is there, there really is this focus with cowboy poetry as an occupational art form. It really is about celebrating, and also maybe lamenting a little bit, the work that happens on the range, in your saddle club or in your little ranch." Higgins said the cowboy poetry festival is the fruit of the Mountain View community's hard work. "I have friends, colleagues, folklorists who work at the Western Folk Life Center and of course they are the host of the national cowboy poetry festival," Higgins said. "To know about that and to see a community in Missouri be so excited about hosting this event, the content of the programming, and the people who come to the event are so excited about the event, that's the thing that's always struck me: The enthusiasm and the positive energy that they have for it." For a full report from the cowboy poetry festival, stay tuned to KBIA.